Takata may have a more significant recall on tap for the problems it is having with its airbags. Serious injuries and at least 2 deaths have been linked to these airbags, leading to a recall of a whopping 14 million vehicles manufactured by 11 different automakers between 2000 and 2011. Now your first thought has to be relief because you are not driving a Takata car. But that is the big difference between the Toyota debacle and this one. This one involves a part supplier that made a component part for the vehicles. So while you may not have heard of Takata, you have heard of Honda which was Takata’s biggest client. That gets your attention. Chances are, you or someone you love is driving a Honda. This post will keep referring to Honda, Honda, Honda. As you will see, they were central players in this from the beginning and could well be more culpable than Takata. We just don’t know. But others were involved too. BMW had to recall 1.8 million cars in this mess. Other car makers are involved in this mess and it is who’s who: our big three, GM, Ford, Chrysler, and Mazda, Toyota, Nissan, Mitsubishi, Subaru, and Isuzu were all involved to a lesser extent. Honda is getting attention because they at least seemed to be the biggest user and were more in the loop than the other manufacturers. Although I do wonder. In 2010, BMW wrote this “hey, are you sure our cars are okay?” letter to Takata. Was that sincere or was it classic CYA? There is still a lot we have to learn. These airbags got redesigned. The reason was a good one. Old Takata airbags emitted toxic fumes when they were released. 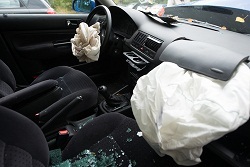 The new airbags are blown up by an explosive that is encased in a metal canister. Rule number one of making these airbags should be making this canisters in such a way where they don’t explode on impact, right. Because if you have metal flying at you at a high rate of speed, it is possible that the car accident is the least of your worries. That is exactly what is going down in a lot of these Takata recall cases. The injuries are minor but the impact is significant enough where the airbag is deployed. So your real injuries are not from the crash but from the flying metal. That is going to be one of the driving forces that is going to allow the media to run with these cases. If a rug getting in the way of the accelerator was interesting to reporters, flying metal shrapnel reminiscent of a battlefield is really going to get their attention. The lawsuits in this cases are going to ask this Nixonian question. The preliminary answers do not sound good. They knew of this problem early. Federal law requires car makers to disclose defects. The first case reported to Honda was in 2004. Honda followed the law and reported the concern. But neither Honda or Takata ever told anyone that these airbags posed risk of one of these metal canisters exploding and spewing out metal flying at who knows how fast. What about the injuries suffered by the victims in 2004 (there were a few). Honda settled those cases. Quietly. I can’t tell if a lawsuit was filed. But I doubt it. I bet they dramatically overpaid for the cases and everyone stayed in the dark. Sure, they looked for the problem and kept telling themselves and everyone else in the loop that the problem had been fixed. A lot of onions need to be peeled in terms of who knew what, when. There will not be a lot of these cases. But the cases that are out there may have real settlement and trial value. If you or a loved one has been injured involving a Takata defective airbag, use this form today to get a free on-line case evaluation.